Looks as if Oppy’s tire tracks have been erased and the parachute quite a bit redder than the first pictures taken back in 05. Yes.. the tracks were the first thing I looked for! 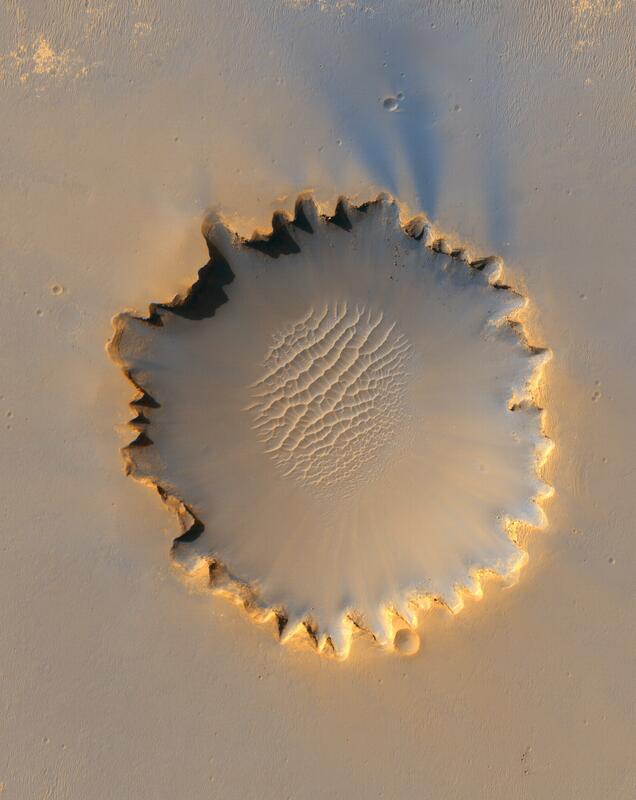 That was pictured on October 6 2006, 5 sols after Oppy arrived at Victoria crater. The rover is actually visible in the picture, on the rim at “Duck Bay” approximately the 10 o’clock position along the crater rim. The range to the target site was 297 kilometers (185.6 miles). At this distance the image scale is 29.7 centimeters (12 inches) per pixel (with 1 x 1 binning) so objects about 89 centimeters (35 inches) across are resolved. I think it would be really cool and provide useful science to send a mission to land next to Spirit’s LZ and retrace her route. Then find her and move her to a more advantageous location/sun angle. Dust off her solar panels and cameras, add jumper cables and battery A/R and use her as a stationary weather station. If she’s totally defunct, it would still provide a lot of science to look at how she and her tracks have weathered over the years and to re-investigate some of her discoveries with newer/better instruments! Some day anyway.. someone is sure to see Spirit again!